to choose the area that best meets your needs and the housing style that best fits your lifestyle ! If you plan to buy an apartment or house in Hauts de Seine, don’t hesitate to contact Stéphane Meignant, your Côté Acheteur Hauts de Seine buyer agent ! The department, Hauts-de-Seine is a part of the ‘little crown’ in the Ile-de-France region. It is the smallest department in the ‘Parisian crown’ but it is the most populated. 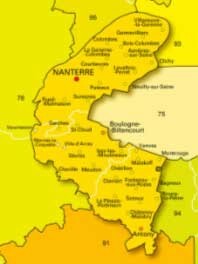 It is divided into three wards : Nanterre, Boulogne-Billancourt and Antony..The prefecture, or the ‘county seat’ is in Nanterre. 45% of the acreage in the Hauts-de-Seine is either wooded or green space. 300 kilometers of walking trails traverse the area. Day trippers, families who love the outdoors, and tourists by the millions frequent the parks and woods, as well as revisit history and art of all kinds. Inquisitive minds can always find something of interest to see and do in the Hauts-de-Seine ! From the historic chateau in Sceaux to the avant guard towers at La Défense, from the ceramics in Sèvres to the autochromes at the Albert Kahn gardens and the fine arts of the 30’s at Boulogne Billancourt. Walk in the footsteps of Chateaubriand or Rodin ! In just the Hauts-de-Seine, you can write a history of art. From the Romans through the Renaissance to the 17th century – epoch of chateaus – all have left testimony to a past sought by tourists. Whether it be Boulogne, Issy les Moulineaux, Asnières or la Défense, the properties are diverse. The only dilemma is choice: whether a single or multi family home, millstone bungalow, Breton farm house, farm to renovate, Normand villa, manor house or apartment – from a studio to a five + bedroom -- in an historic or modern building, a duplex or with a private garden….. Bus lines, motorways and commuter trains, executive airfields and navigable waterways make the region easily accessible from Paris and other areas. Several projects are currently in progress to improve accessibility, such as widening the A13, completing the A86 to the west and improving portions of the RN10 and RN13. With 41 ‘transillian’ train stations, 21 metro stations, 13 tramways, and 19 commuter train stations, Hauts-de-Seine is much less congested than Paris and, for businesses, often economically superior. The highway system includes protions of the A10 and A11 and the A12 and A13 which links the Hauts-de-Seine with the coast of Normandy (Deauville, Caen) as well as the A14, which links it with Paris and La Défense. There are several institutions of higher education in the department such as the University of Paris Ouest, Nanterre La Défense (Paris-X, 33,000 students), Léonard-de-Vinci (La Défense) as well as the Ecole Centrale de Paris (Chatenay-Malabry) and the universities of Paris Descartes and Paris XI. These five centers alone serve nearly 100,000 students. An international hub of international business at La Défense. The department Hauts-de-Seine houses over 100,000 businesses. 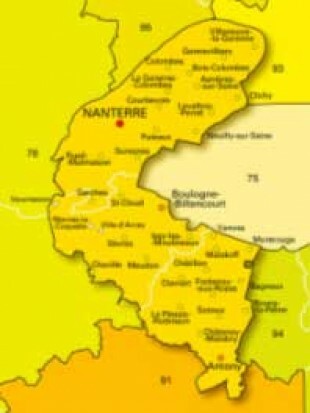 In the northern part of the department, La Défense houses a large part of the economic activity in the Hauts-de-Seine with numerous French and international corporate headquarters, such as:Carrefour (33) in Levallois, Saint Gobain (110) in Courbevoie, Renault (119) in Boulogne, Vinci (169) in Reuil, Alstom (338) in Levallois, Schneider Electric (342) in Asnières and, finally, Thales (498) in Neuilly, all of which give the Hauts-de-Seine major decision making power. La Défense : This center for business has also been classified as a tourist area which allows a number of businesses to open on Sunday. There is a train, the museum of La Défense, multiple skyscrapers and stores, large scale artistic structures, and the ‘Grande Arche’ (headquarters to the Fondation des Droits de l’Homme (the Foundation for Human Rights) on the historic axis and the end of the Charles de Gaulle Esplanade. The Hauts-de-Seine is very diverse. It is both the green space of the Ile de France with the Bois de Boulogne and its business hub with La Défense.